Note: CD comes with a 20 page booklet. 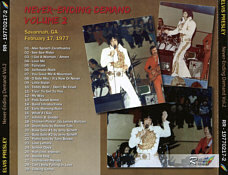 Soon to be released: Rainbow Records presents a new CD set (two separate cds) called “Never-Ending Demand” Vol.1 + Vol.2, featuring the complete performances of February 16, 1977 Montgomery, AL (Vol. 1) and February 17, 1977 Savannah, GA (Vol. 2). The newspaper headlines titled it „Emperor Elvis Still Has It: Memphis Music. Vegas Touch“ and „Elvis Wows 'Em“ – can you ask for more? 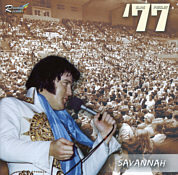 Even the reporters were entertained and satisfied with the shows they attended – their reviews and comments can be found along with dozens of pictures from the actual shows in the accompanying booklets of the 2 new releases. The Montgomery performance has never been released in its entirety until this day. Only a handful of songs were released in 1999 on the CD „Coming On Strong“ featuring the rare performance of „Where No One Stands Alone“. For the new Rainbow Records release (Vol. 1) the producers obtained a first generation tape that has never circulated before and unlike all other audience recordings from this date features „My Way“ as an uncut, complete version and includes the complete Opening Act by the Stamps Quartet. The quality of the show recording is very clear and even the fans that usually avoid audience recordings should give this CD a try – they won’t be disappointed. The booklet features also a review by the person who taped the show plus some interesting and official paperwork from the tour itself. 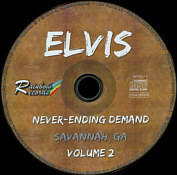 For the second cd, the Savannah show the producers had access to the archive of Savannah’s press & staff photographer Bob Morris who made some high class shots of Elvis in action. He also took a couple of shots of the audience - you can even see the band setting up the stage and tuning the guitars. A total of four newspaper articles are included which set a great spotlight on the situation of Elvis‘ arriving, his security and the show itself. Elvis himself is in a good mood and gives more than a solid performance with highlights like „Little Sister“, „Tryin‘ To Get To You“ and „Polk Salad Annie“. Again the sound on this cd is exceptionally good for an audience recording. Concert: See comments at "From Fans To Fans - Savannah"